Planes, trains, and automobiles is transportation that has carried us through the 20th century, but these days, they’re old news. The transportation of the future will be more along the lines of magnetic levitation, jetpacks, and zip lines that fit in a backpack—and they could be here sooner than you think. ET3 is literally “Space Travel on Earth”. ET3 is silent, low cost, safe, faster than jets, and is electric. Car sized passenger capsules travel in 1.5m (5′) diameter tubes on frictionless maglev. Air is permanently removed from the two-way tubes that are built along a travel route. Airlocks at stations allow transfer of capsules without admitting air. Linear electric motors accelerate the capsules, which then coast through the vacuum for the remainder of the trip using no additional power. Most of the energy is regenerated as the capsules slow down. ET3 can provide 50 times more transportation per kWh than electric cars or trains. Picture this: A brilliant billionaire designs an innovative all-electric car, founds a company to resupply the International Space Station, and invents a super-successful alternative banking system. It may sound like the next summer blockbuster, but it’s real life. Elon Musk is the founder of Tesla Motors, SpaceX, and PayPal, and now he’s revolutionizing public transport. He recently unveiled his idea for an ultra-fast, city-to-city transport system that could get you from San Francisco to Los Angeles in just 35 minutes. Hyperloop is described as an elevated steel tube containing aluminum capsules that would travel at speeds over 1,200 kilometers per hour (760 mph), ferrying cars as well as people. Oh, and it would all be powered by solar energy. The major drawback? The price tag. Musk estimates that Hyperloop would cost $70 billion just to get started. The final expenditure could be a mind-boggling $100 billion. But Hyperloop also has its critics. Many complain that the system is too expensive, too impractical, even too slow. Nevertheless, the plan is rolling ahead. A start-up named Hyperloop Transportation Technologies, Inc. has published a timeline projecting the completion of a Hyperloop prototype in the first quarter of 2015. Only time will tell if this is actually feasible, but who knows? The future could be here sooner than we think. Even though everybody seems to be terrified of nuclear energy these days, it could very well be a huge part of our future. And there’s one American company that’s powering headlong into the radioactive transportation business. For years, Laser Power Systems (LPS) has been touting the benefits of thorium, a radioactive element that’s largely responsible for generating the heat at the center of the Earth. While nations are busy researching thorium for use in nuclear power plants, LPS has a more direct goal: They plan to build a car engine that’s powered by a single, small chunk of the radioactive material. The engine would work by focusing the heat given off by the thorium and using it to turn water into steam, spinning a series of microturbines to generate eletricity. Thorium is incredibly dense, which means it holds a lot of energy—an eight-gram nugget would be able to power a car for over 100 years. In other words, you would never have to shell out another penny for gas. Now that’s a future we can all get behind. In the world of nautical engineering, no idea is picking up speed faster than supercavitation. Supercavitation is an effect created when a layer of gas bubbles is formed around an object inside a liquid (imagine the submerged hull of a boat surrounded by bubbles). The gas reduces friction by up to 900 times less than the normal amount, allowing the object to move much more quickly than normal through the water. It goes without saying that a supercavitating boat would be a tremendous asset to any navy fleet. In addition to its high speeds with relatively low fuel expenditure, its speed and shape would make it difficult for sonar to detect. It could even outrun torpedoes. Juliet Marine Systems, a private company in Portsmouth, New Hampshire, is trying to make such a boat. Called the GHOST, it is intended for defense—protecting naval vessels, and fending off pirates who might try to attack commercial ships. It could also be an efficient ferry, particularly when moving troops to enemy shores. One of TIME magazine’s Top 50 Inventions for 2010 has been called “the world’s first practical jetpack.” Yes, that iconic space-age vehicle is no longer just a figment of your average sci-fi writer’s imagination. 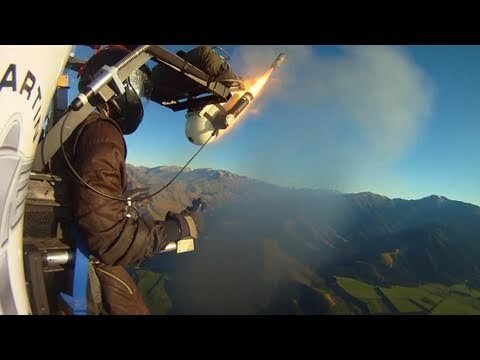 Glenn Martin, a New Zealander with a vision, has been working on his jetpack design for over 30 years, and it’s finally nearly ready for commercial sale. The Martin Jetpack is powered by ducted fans and can fly for up to 30 minutes at a time. It has a maximum speed of just under 74 kilometers per hour (46 mph), and can reach altitudes of 900 meters (3,000 feet). Imagine gliding along nearly a kilometer above the ground, powered by nothing more than the pack on your back. It’s a reality that’ll come first to firefighters and emergency teams, as the Martin Jetpack is currently being developed for use as a first-responder vehicle. But don’t worry: It should be available for personal use by sometime in mid-2014—for those who have a spare $200,000. It would be nice to bike to work every day, but let’s face it—it’s a lot of effort. Well, soon it might get a little bit easier. In 2006, Toronto unveiled plans for a “high-speed, all-season, pollution-free, ultra-quiet transit system that makes people healthier.” In other words, a bike path on steroids. Designed by Toronto architect Chris Hardwicke, the idea was to build an elevated, three-lane tube for bikes. The tubes would be separated by direction, allowing for air circulation that would create a tailwind. Bikers’ efficiency could be improved by as much as 90 percent, and they could reach speeds of 50 kilometers per hour (31 mph). Velo-city, as the project is called, would also be ideal for cold-weather climates, as bikers would be protected from the elements. Although there was a lot of excitement when the idea was first proposed, velo-city was eventually shelved due to lack of funding. However, although it may be gone for now, it’s not forgotten. Perhaps we’ll have bicycles whizzing comfortably above our heads in the near future. We’ve all heard about Google’s self-driving car. But have you heard about Next? Part taxi, part Segway, part origami construction with an emphasis on social interaction, Next has to be seen to be understood. Essentially, designer Tommaso Gecchelin envisions a world in which you use your smartphone to call Next, and a self-driving module comes to pick you up. You slide into the configurable seat, and the doors close. Your module scoots along on four wheels until it meets up with a group of other modules. Then the magic happens: Your seat stays upright, while around you the module rears up on two wheels to connect to the group. A panel opens, and suddenly you have the impression of sitting on a bus or a train. Modules can split off as easily as they join on. As you approach your destination, your module unhooks itself to drop you off seamlessly. It’s a fantastic idea. Unfortunately, we’ve got a long way to go before we’re ready for Next. In his design plans, Gecchelin outlines the timeline of technologies that have to be developed or improved before Next can feasibly be built. That includes production of cheap nanomaterials, a consumer self-driving car, a high-capacity battery, and high-capacity, cheap solar panels. All in all, Gecchelin figures we won’t be ready for Next until at least 2025. Believe it or not, a zip-line commute could soon become reality with Kolelinio, a concept put forth by Martin Angelov at the TEDx conference in Thessaloniki in 2010. Angelov envisions a network of wires crisscrossing the skies, allowing people to zip from place to place. As he points out, we drive vehicles that can weigh 20 times more than our own bodies, and our roads are expensive to build. His idea would do away with that, as well as contribute to a greener transportation infrastructure. Travelers using Kolelinio would fasten themselves into a battery-powered seat dangling from a taut steel wire and go whizzing along, staying close to the ground in pedestrian zones and rising higher in areas with traffic. There are a few drawbacks, however. Kolelinio offers no protection against bad weather, it’s obviously not ideal for people with a fear of heights, and there are a lot of questions about safety. Nevertheless, it’s an innovative idea, and we’ll keep crossing our fingers that someone decides to make it real sometime soon. The Skylon is being touted as the successor of the Concorde, the plane that traveled faster than sound but was retired nearly 10 years ago. In 2013, the United Kingdom announced plans to spend more than $90 million developing the Skylon, a super-fast plane that could travel at five times the speed of sound and break out of the Earth’s orbit to travel in outer space. It would be able to take off from any runway in the world, and could bring 300 passengers from London to Sydney in four hours. Or it could be used to drop off a load of up to 15,000 kilograms (33,000 lb) in outer space—at the International Space Station, for example. Development has only just begun, and there are some formidable obstacles to overcome. John Hansman, the head of MIT’s International Center for Air Transportation, says, “It looks great from a science fiction standpoint, but it’s really, really tough to do.” Additionally, the $90-million figure is just the beginning—final costs could amount to more than a billion dollars. However, many scientists and science journalists are optimistic about the project. And if everything goes according to plan, a prototype will be ready by 2017, with the real deal following just a couple years later. After that? “Access to space, access to anywhere in the world within four hours is on the cards,” says Alan Bond, the founder of Reaction Engines, the company behind the Skylon’s propulsion system. Say hello to the Harley Davidson’s time-traveling nephew. This concept vehicle is sleek and streamlined and vaguely motorcycle-shaped, but it’s also enclosed, with plenty of room for luggage, and it’s powered by either batteries, biofuel, or a fuel cell. You can drive it manually, but it can also navigate itself on certain dedicated pathways. Oh, and it’s city-friendly: It drives on four wheels, but tilts up on two for easy parking. On top of all that, it’s collapsible. Designer David Miguel Moreira Goncalves had the urban environment in mind when he drew up his plans. He said in his original report that “the aim of this project was to develop guidelines and a holistic solution for a new system of urban transport, composed of vehicle and infrastructure, in a sustainable way and adaptable to various urban environments.” In other words, he noticed that people prefer personal vehicles over public transportation, so he tried to come up with something easy and environmentally friendly that could still be individualized. No SCARABs have been built yet, but we’re hopeful that sometime in the near future we’ll be able to hop into one of those babies and go for a hip, eco-friendly spin. Tel Aviv, Israel is in the heart of the Fertile Crescent, the ancient cradle of civilization. But it’s anything but outdated. Tel Aviv is a vibrant, bustling, 24-hour city—with a major traffic problem. That’s why they’ve set themselves the goal of building aerial magnetic public transportation in the near future. They’re calling it SkyTran. As with many other futuristic transport ideas, the designers of this one had their sights set on the clouds. 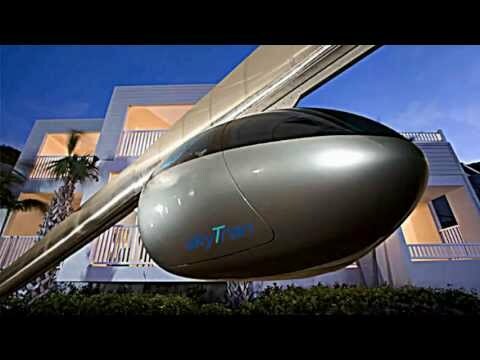 SkyTran will run on metal tracks six meters (20 ft) above the ground, although they won’t actually be “on” the tracks: The pod-like cars will hang below the tracks, floating along nearly friction-free thanks to maglev (magnetic levitation) technology. Passengers will be able to use a smartphone app to call a car to the nearest station (picture a staircase going up to a simple platform). Cars can run independently and will take riders as close to their destination as tracks allow. According to SkyTran’s CEO, Jerry Sanders, a SkyTran ride will cost a little more than a bus, but less than a comparable distance in a taxi. Additionally, once solar panels are installed, the SkyTran system will beenergy neutral. SkyTran will be capable of speeds of up to 241 kilometers per hour (150 mph), but it will run slower, at least at first, as riders get used to the idea. It sounds like something out of a 1950s comic book and, to be honest, the aerodynamic car shape looks like it, too. But maybe we’ll all take a leaf out of Tel Aviv’s book and start zooming around the skies like the Jetsons. The future is now, after all.